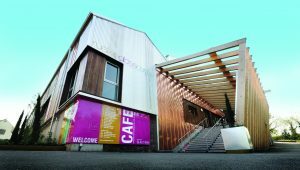 Ruskin Glass Centre Cafe is open Monday – Saturday, 10am – 4pm. Closed Sundays and Bank Holiday Mondays. The businesses & studios located onsite are entirely independent and their opening times vary. Please see the Studios/Tenants page for their individual opening times. Stourbridge is well served with bus and train links to Birmingham and other towns in the West Midlands. The Glass Centre is situated 5 minutes drive from the Centre of Stourbridge. If you are travelling by bus; the Centre is served by the 250 and the 251 as well as a number of other local bus routes. If you are coming by car, follow the signs for Stourbridge from the M5, Ruskin Glass Centre is signposted off the A491. There is a car park on site, and there are several car parks nearby. Ruskin Glass Centre is fully accessible for visitors with disabilities. We have a wheelchair lift to enable access via the front stairs as well as slopes adjacent to the building if level access is required. The brand new 30 cover café is open between 10.00am and 4.00pm, 6 days a week, and offers a mouth-watering selection of organic homemade cakes, light lunches and freshly ground Shropshire coffee. The dishes are freshly prepared on-site everyday, and the menu is updated weekly. Ruskin Glass Centre is home to 18 independent businesses, predominantly in the indigenous trade of glass, many of which have retail areas for you to browse and purchase their wares. There is also a number of complementary businesses also on site, including handmade soap, holistic treatments, sculpture, woodwork, furniture making, cards, books & prints. For more information visit out tenants page to discover what products our businesses have to offer.